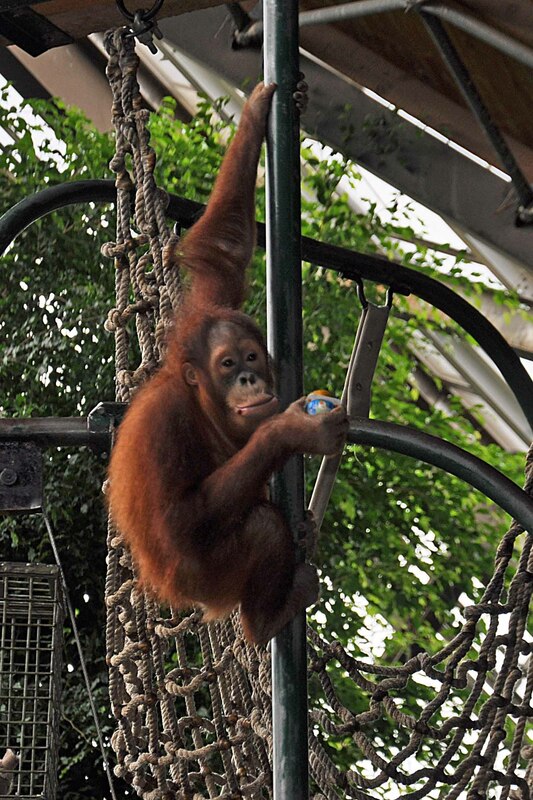 This entry was posted in life, Nature, Photography, Uncategorized and tagged Endangered species, nature, orangutan, Photography, Zoo, Zoology, Zoos and Aquariums. Bookmark the permalink. Zoos are incredibly important. Since we can no longer protect most species in the wild they may be the only way to save them. Great post, I love visits to the zoo….but I always have a tiny, uncomfortable feeling……..
A tough question indeed. Though I do appreciate educational value and conservation efforts of zoo. I think Zoos can be educational and save a few animals but overall I feel bad for the animals captured and have mixed feelings about viewing them..My grandchildren love to go to the zoo. A can still picture a huge tiger from my childhood. Pacing and pacing in a 6×20 cage. He must have been going stark raving mad. Miami has a huge “free range” zoo. Such an improvement. I can seen a “I know I am captured” look in the ape’s and monkeys” eyes, however. The Toronto Zoo is one of the best in the world. Ranking either 2nd or 3rd in all the “10 bests” that I have seen. It is over 700 acres and has wonderful programs and great habitats for the animals. They are still limited in range but as far as zoos go, it is world class. I too remember zoos of the past with horrible cages for the animals and I am so happy zoos are now more humane. I’ve had the same feelings when going to the zoo. A real mixture of feelings. On one hand I’m trying to educate, on the other, I want to cry for the animals that pace back and forth. There are some bigger zoos that offer better environments for the animals. But that takes lots of money…and it leaves the smaller zoos behind. Zoos do offer a chance to observe animals that we ordinarily would never see without traveling to exotic countries. And most do a good job of educating our young children with programs they offer. You raise a difficult question. If a visit to the zoo heightens one’s concern for animals in the wild and what is happening to their habitats then I think it has value beyond sheer entertainment. I agree with the other readers who have mentioned that zoos have improved vastly over time. Also, keep in mind that many of today’s zoo animals were born in captivity and wouldn’t even know how to survive in the wild. I am conflicted when it comes to zoos. There is the good, the bad and sometimes the ugly side to zoos. I have gone to zoos as well as those other kinds of zoos. I would rather go to a zoo run by the city – much better experience for me and my heart. Thanks for bringing up this topic! Personally, I am so against caging any healthy, wild animal. It is cruel and a travesty against nature. If there are going to be zoos, then they should be reserved for injured or disabled animals that could not otherwise survive on their own. With today’ technology, animals of all species can easily be observed in books and on film. I think technology (along with more accessible travel to places where the animals can be observed in their natural habitat) provides the middle ground between our need to know more about wild animals and their right to live as they were meant and built to live. I am very conflicted about zoos too. On the one hand I love that they provide a closer, personal look to so many animals we may never see otherwise. I love how educational most zoos are nowadays with different programs and creating better enclosures/environments for the animals. And I love how many endangered species have been saved from extinction due to zoos. However, after watching documentaries about wild life and seeing how they really live in the wild, it doesn’t seem fair to see them boxed in and so limited in their habitats–no matter how large it may seem. I remember watching a show that show the migratory paths of a pride of lions over the course of a year…they covered hundreds and hundreds of miles. If it’s a good zoo with plenty of room, food and good conditions, then it’s a great way to educate people, and especially kids, about animals. I’m a big fan of zoos, sanctuaries, and aquariums. Very few of our animals at the San Diego Zoo and the Safari Park are in cages per sé, and those that are have big cages so that they can roam or fly around sufficiently. I might have felt differently 50 years ago when everything was in a cage just large enough for it to stand up. Most of today’s Zoos and Aquariums are involved in conservation efforts, and the San Diego Zoo has been at the forefront of conservation for about 40 years. It has reintroduced California condors into the wild, rhinoceroses, gray wolves, etc. I read Madhu’s comment. Perhaps Earth is our cage in this great Universe! The picture of the orangutan is so pretty and with vivid colors. And yes he is living a good life, at least he looks like he is. I enjoy visiting the zoo, and the one we have here in Jerusalem is very beautiful, and it seems to me that the animals are quite comfortable there. I agree, that there is a problem in our directing the lives of other animals… but I think that in many ways, our freedoms too are limited by society, conventions and rules. 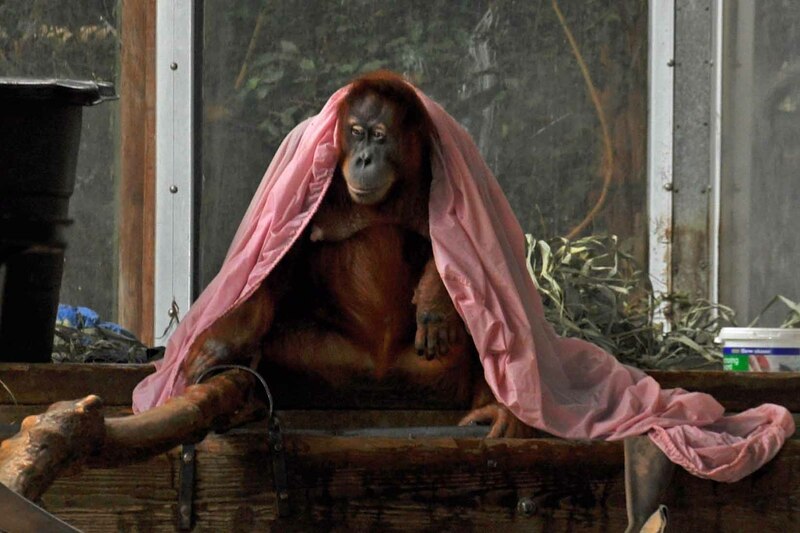 I liked this picture of the orangutan. basically most zoos have come a long way from what they once were. Breeding facilities, environments instead of cages, species preservation, education . It is still a cage in the end but does the animal realize that? sometimes. Zoos have been around since ancient times (actually more than 2,000 years old, if not older), but they’ve always served a duel purpose of entertainment and education. The Library of Alexandria was one part of a larger museum that included a zoo of exotic animals. Of course today they can also serve a third purpose of conservation. I think the issue comes up with the question of whether the entertainment that we get from the animals is contrary to their wellbeing, and whether the education provided outweighs whatever harm may possibly be caused. The idea that animals should be free is a good one, but how free do they need to be for it to be said there’s no harm caused? If an enclosure is large enough they would still technically not be free, but would they still be harmed or stressed by it? You could also look at other aspects of their quality of life, such as how well fed are they compared to wild counterparts and what is their life expectancy in a zoo versus the wild. Some animals have an average life expectancy in the wild of just 2-4 years, but in captivity may live 15-20 years thanks to improved and steady food, medical care, and a safe environment. I can’t say I completely like the idea of animals kept in zoos, especially since some aren’t as good as others and not all animals have an enclosure that’s nearly large enough, just that there’s so many beneficial things that zoos offer that I can’t be against them either. Trying to imagine the reverse. The Orangutan and her kids as the higher species and me inside that cage………not cool!